Remember the flying birds on the wall of Hilda Ogden’s house in Coronation Street? We featured an updated version a few months back, courtesy of Andrew Tanner. 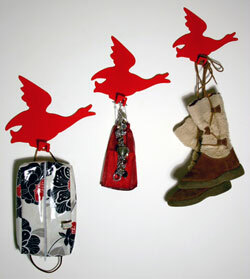 And now there’s a practical version – these Jethro Macey Flying Duck coat hooks. Very much in the same style as the vintage classics, these birds are available in powder-coated stainless steel and in a choice of colours – pink, blue, green, yellow and white. But best of all, these have a use other than decoration – as coat hooks. Sold as a set of three, you can pick up a set for £55.